Thousands of South Africans converged on the capital, Pretoria, to protest what they say is the abuse of state resources and institutions, ratcheting up the pressure for President Jacob Zuma to resign or be removed from office. Chief executives of some of South Africa’s biggest companies are joining the protests along with members of civil rights, religious groups, opposition parties and a number of prominent members of the ruling ANC. They plan to converge on the high court, where Zuma’s lawyers are seeking to block the release of a report by the nation’s graft ombudsman into allegations that the Gupta family members, who are friends of the president and are in business with his son, sought to influence cabinet appointments and state contracts. 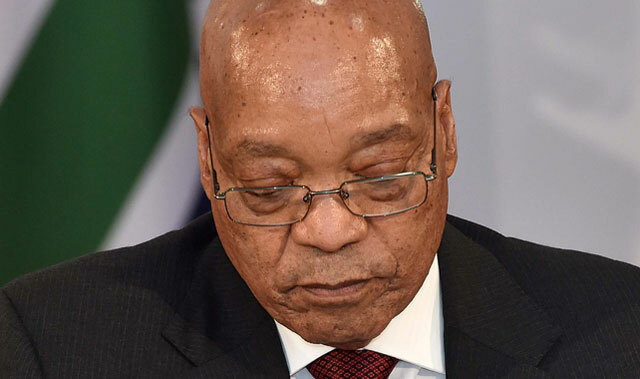 Scandals have dogged Zuma in recent months, including a finding by the nation’s top court that he violated his oath of office by refusing to abide by a directive from the graft ombudsman to repay taxpayer money spent on upgrading his private home. He’s also been locked in a battle for control of the national treasury with finance minister Pravin Gordhan — who was charged for fraud last month before prosecutors abandoned the case for lack of evidence. The political upheaval has weighed on South Africa’s rand and bonds and raised the risk of the nation’s credit rating being downgraded to junk. “The importance of being here is to stand up and say what we stand for, which is the constitution and all the values enshrined in the constitution, as well as to say what we don’t like and what we don’t stand for, which is the inappropriate use of state institutions and corruption,” Standard Bank co-CEO Sim Tshabalala said in an interview. The National Health and Allied Workers Union, an ANC ally with about 300 000 members, urged Zuma on Tuesday to take the “honourable and courageous decision” and step down before his current term ends in 2019 and for his deputy, Cyril Ramaphosa, to replace him. The South African Democratic Teachers Union, National Union of Mineworkers and Police and Prisons Civil Rights Union are also set to call for Zuma’s resignation, Business Day reported on Wednesday, citing union officials it didn’t identify. Zuma, whose allies dominate the ANC’s leadership, has denied ever intentionally breaking the law and shrugged off calls to resign. Zuma shouldn’t shoulder the blame for the ANC’s failings and removing him won’t resolve South Africa’s problems, The New Age newspaper reported Wednesday, citing ANC secretary general Gwede Mantashe. Cheryl Carolus, a former ANC leader, urged the party to act in the national interest and address the nation’s leadership void. You mean recent decades. The “leaders” and unions mentioned all propped him up for far too long!